Ammar Azzouz is an architect for Arup, and is currently a Visiting Scholar at the University of Cambridge, Department of Architecture at the Centre for Urban Conflicts Research. His research paper 'architects at the time of war' has been shortlisted for the RIBA President's Awards for Research for 2018. It builds on a set of interviews with architects inside and outside Syria, to investigate the role of local communities, architects and charities in responses to destruction of the built environment. 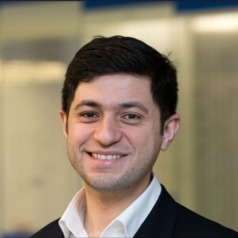 Ammar studied Architecture at Al-Baath University, Homs, Syria before moving to the UK to complete his MSc in Project Management in Construction. Ammar joined the University of Bath, Department of Architecture and Civil Engineering in 2013 to study his PhD under the supervision of Dr. Alexander Copping and Dr. Paul Shepherd. His work has been published in different platforms including the Independent, the New Statesman and the Architects Journal. Ammar research focuses on digitalisation in the built environment, as well as cities, conflicts and local responses to destruction.